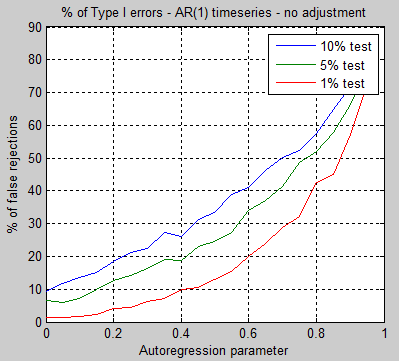 In the last article we saw some testing of the simplest autoregressive model AR(1). I still have an outstanding issue raised by one commenter relating to the hypothesis testing that was introduced, and I hope to come back to it at a later stage. 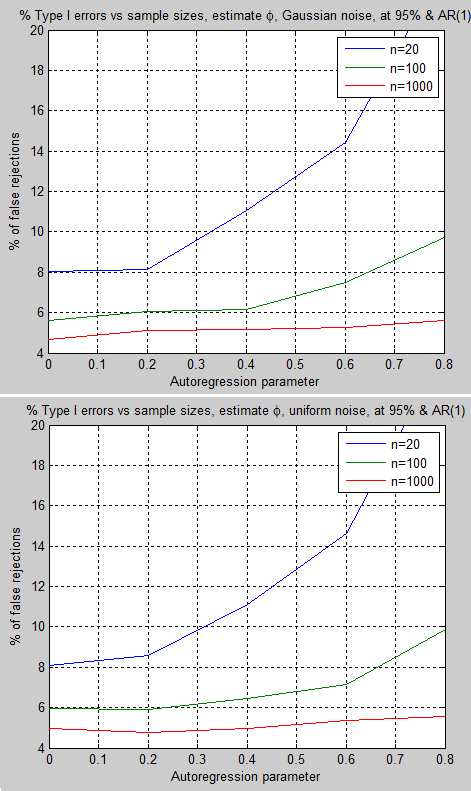 Before we move onto more general AR models, I did do some testing of the effectiveness of the hypothesis test for AR(1) models with different noise types. 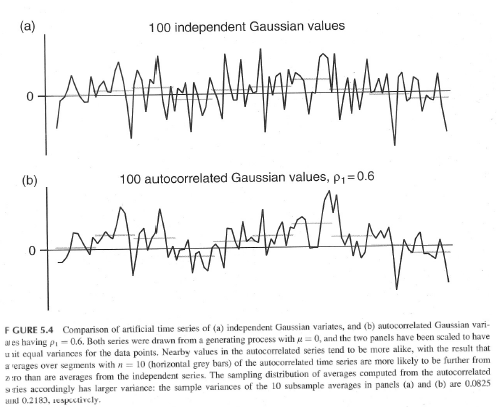 The Gaussian and uniform distribution produce the same results. 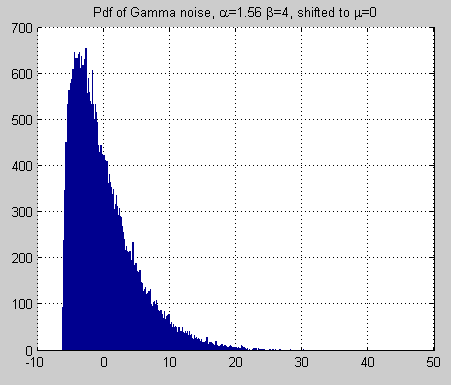 The Gamma noise result isn’t shown because it was also the same. 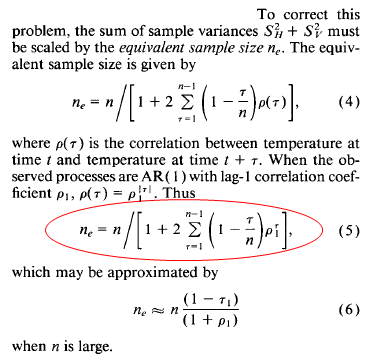 So in essence I have found that the tests work just as well when the noise component is uniformly distributed or Gamma distributed as when it has a Gaussian distribution (normal distribution). 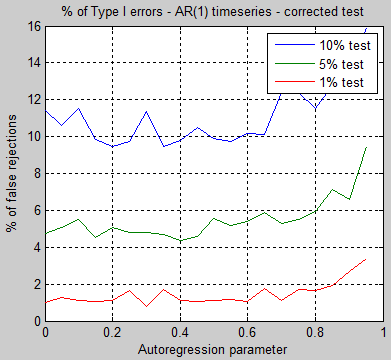 The next idea I was interested to try was to apply the hypothesis testing from Part Three on an AR(2) model, when we assume incorrectly that it is an AR(1) model. As we can see, the test, which should be only rejecting 5% of the tests, rejects a much higher proportion as φ2 increases. This simple test is just by way of introduction. In non-technical terms, the next value in the series is made up of a random element plus a dependence on the last value – with the strength of this dependence being the parameter φ. There is a bewildering array of tests that can be applied, so I started simply. With some basic algebraic manipulation (not shown – but if anyone is interested I will provide more details in the comments), we can produce a series of linear equations known as the Yule-Walker equations, which allow us to calculate φ1..φp from the estimates of the autoregression. First of all I played around with simple AR(2) models. The results below are for two different sample sizes. A population of 90,000 is created (actually 100,000 then the first 10% is deleted), and then a sample is randomly selected 10,000 times from this population. 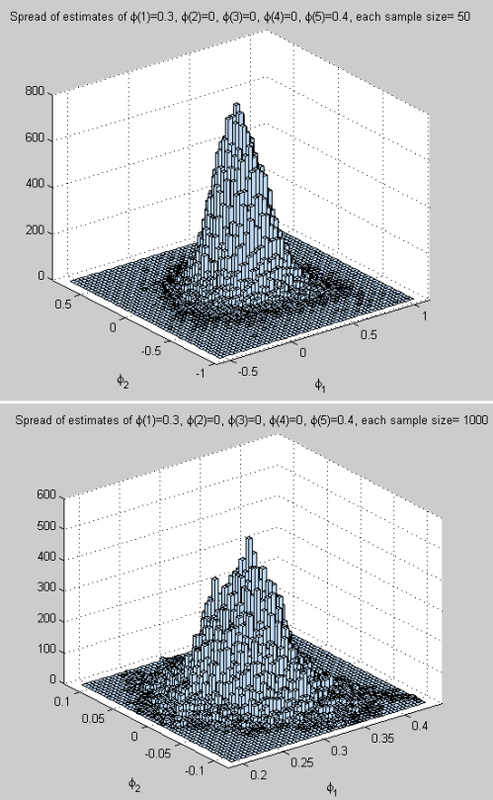 For each sample, the Yule-Walker equations are solved (each of 10,000 times) and then the results are averaged. 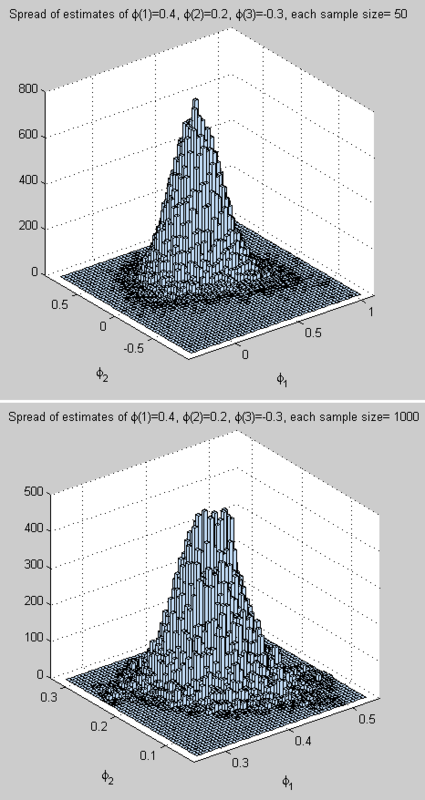 Notice that the sample size of 1,000 produces very accurate results in the estimation of φ1 & φ2, with a small spread. 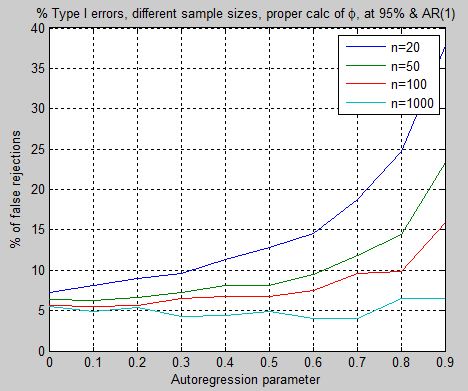 The sample size of 50 appears to produce a low bias in the calculated results, especially for φ2, which is no doubt due to not reading the small print somewhere..
Then I played around with a more general model. 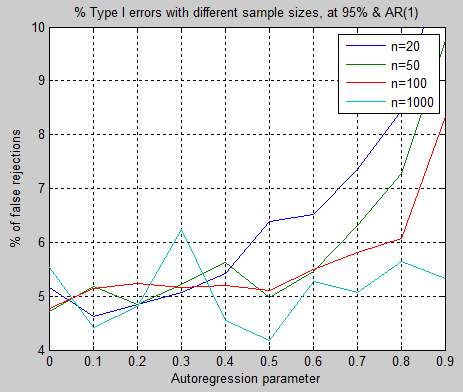 With this model I send in AR parameters to create the population, but can define a higher order of AR to test against, to see how well the algorithm estimates the AR parameters from the samples. In the example below the population is created as AR(3), but tested as if it might be an AR(4) model. 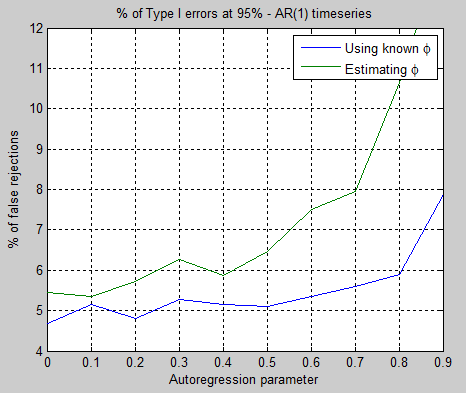 The AR(3) parameters (shown on the histogram in the figure below) are φ1= 0.4, φ2= 0.2, φ3= -0.3. [The reason for the finer detail on this histogram compared with figure 5 is just discovery of the Matlab parameters for 3d histograms]. 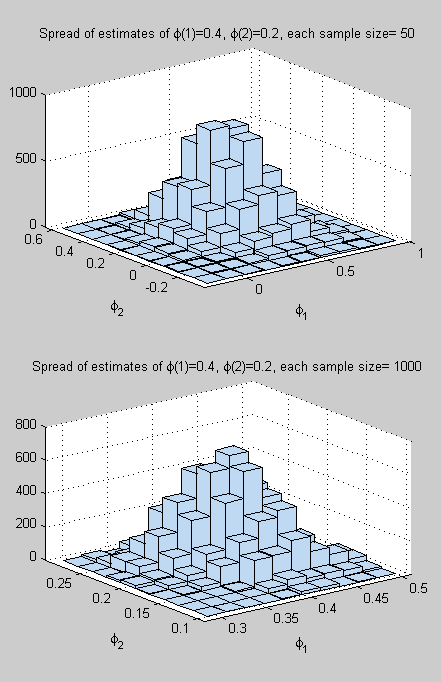 Rotating the histograms around in 3d appears to confirm a bell-curve. Something to test formally at a later stage. 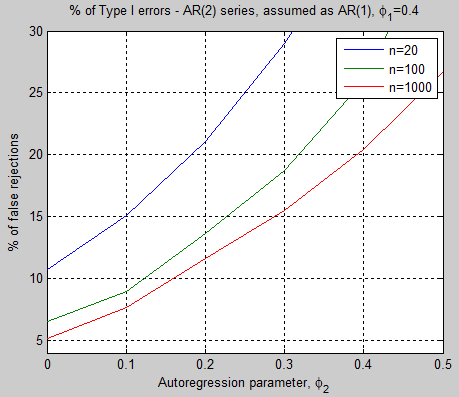 We haven’t yet seen ARMA models – auto-regressive moving average models. And we haven’t seen MA models – moving average models with no auto-regressive behavior. What is an MA or “moving average” model? The term “moving average” is a little misleading, as Box and Jenkins also comment. Because for AR (auto-regressive) and MA (moving average) and ARMA (auto-regressive moving average = combination of AR & MA) models the process is stationary. This means, in non-technical terms, that the mean of the process is constant through time. That doesn’t sound like “moving average”. So think of “moving average” as a moving average (filter) of the random elements, or noise, in the process. By their nature these will average out over time (because if the average of the random elements = 0, the average of the moving average of the random elements = 0).